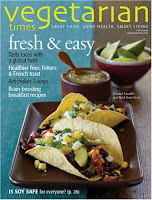 Today ONLY you can subscribe to Vegetarian Times Magazine for as little as $4.44 per year. Each issue brings you mouth-watering recipes, tips on making old favorites healthier, and the latest nutritional information to help you live better. It includes features on health, diet, and fitness, making it the must have magazine for every vegetarian or "wanna-be" vegetarian..
You can also take 20% off any other subscription at DiscountMags.com when you enter coupon code JINXY at checkout.